It's time to take cinnamon out of the kitchen and into the bathroom! 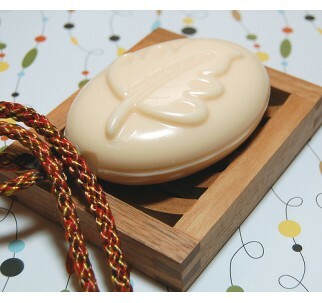 The widely popular spice that people enjoy for its flavor has now been captured in a rope soap. Recent studies have shown that there are health benefits to using cinnamon that make the spice even more desirable. Adding a little cinnamon to the diet can help lower the blood sugar of diabetics and others with blood sugar problems by reducing blood sugar levels by about 20% in a matter of weeks. The same study found that including cinnamon in the diet can also lower levels of bad cholesterol. We're not suggesting that using this new cinnamon scented soap-on-a-rope will provide any medicinal benefits. We just thought you'd like to have another reason and another way to enjoy this popular spice. So try a bar today. Just don't put it in the oven by mistake! This new deliciously fragranced rope soap is the latest offering from the soapcrafters at Mobility Bath. Proudly made in Ohio by Mobility Bath Products. All of their soaps on a rope feature an extra long safety rope for easier use in the bath and shower for folks with limited mobility. The ropes feature a breakaway safety device to avoid choking.